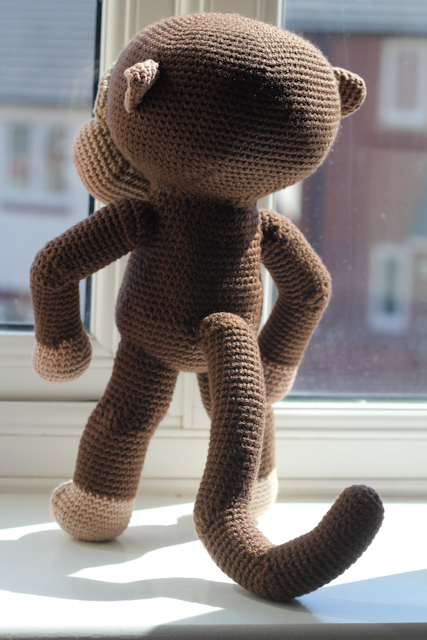 A while ago I mentioned a big project I made this month and now it's time to show it, so I'm proudly presenting you all MIKE THE MONKEY! 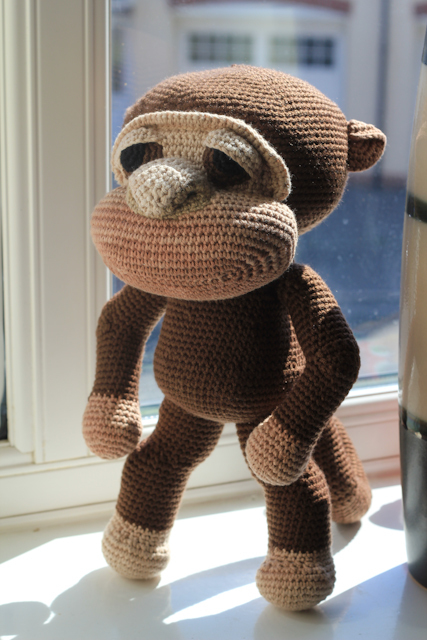 This crocheted monkey was an order. 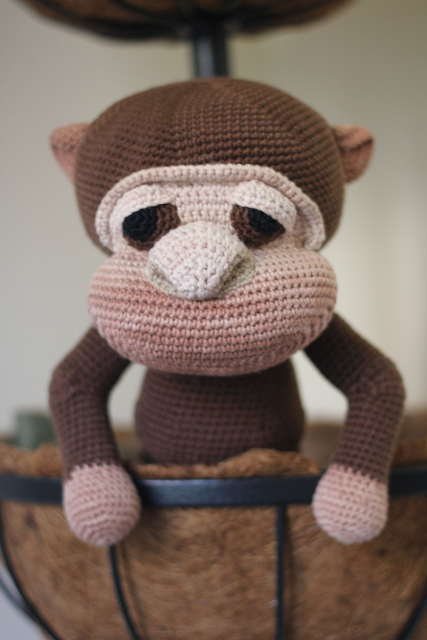 I was asked to make a monkey for a little boy aged 1,5 who has been on a safari and liked the monkeys more than anything else. 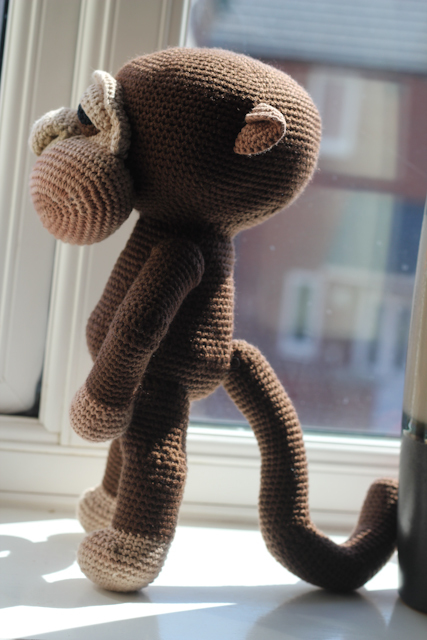 I never made monkeys before so it was quite a challenge for me. 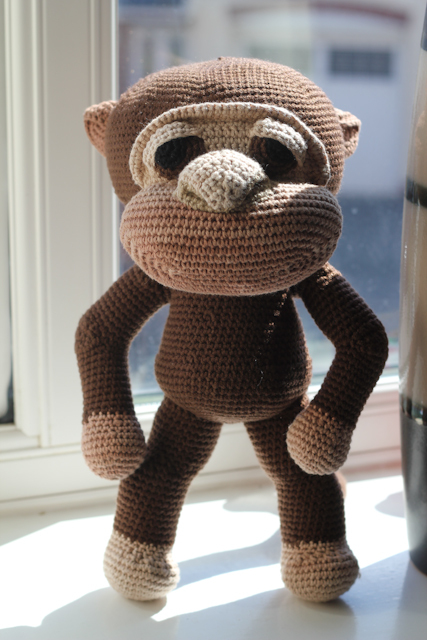 I've spent acouple of days just trying to figure out how a monkey should look like and then it took me about a week to crochet (I've changed the arms 3 times, and the legs 2 times) and I can say that in the end I'm kind of proud of myself. 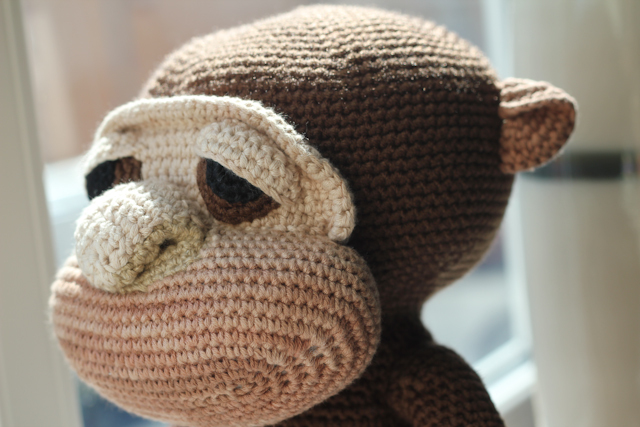 The design and crocheting is 100% my, the yarn is cotton & acrilic, no little bits, no beads or buttons, so it's complitely safe for the babies under 3. 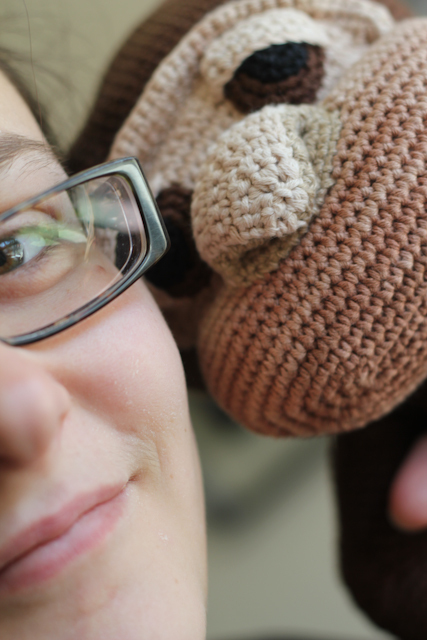 And here I'm with the monkey, so you can see how big it actually is. 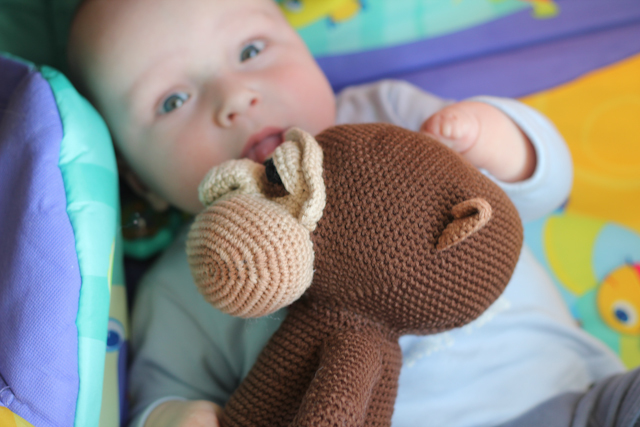 And here is the monkey and My Little Man. His firs reaction was amazing - give it to me, mummy, give it! 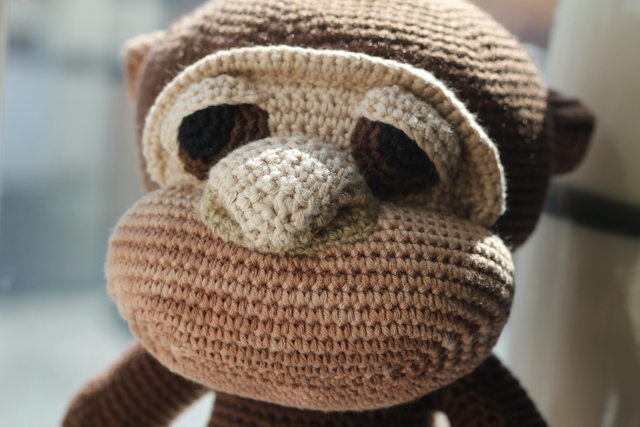 Well, I didn't let him to chew and soak it, so I had to mamage to make a quick photo and take the monkey away. And I'm glad and proud of myself (again!) because the little one I was making it for really enjoyed it! 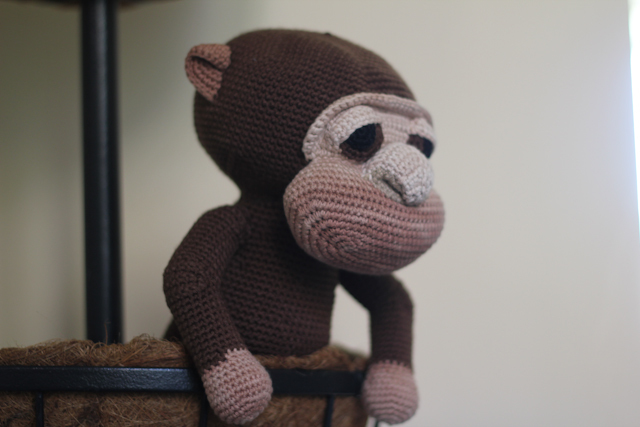 Now I should make a pattern for it, as my friend in the wool shop aslo fell in love with the monkey and immediatly asked me if I've written it all down. Shure I did! So the pattern will be available in a while at Knitters World Scarborough. wow, It's a great work! LOVE this!!! Please can lil Frank have one? ?